Sight word and spelling word games are probably my very favorite kid activities. We haven’t done outside spelling or sight word practice for a while and I thought was about time (the weather is perfect for it). We loved sight word twister, so I put some thought into finding another game that I could modify using Big M spelling word list. 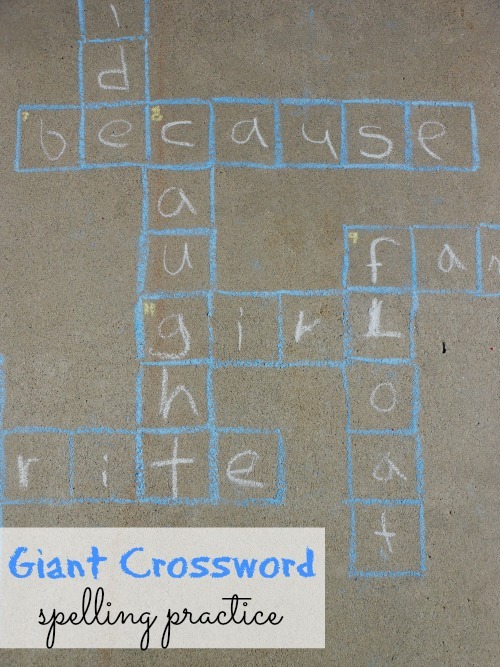 I decided on a giant crossword puzzle designed around his spelling words. Fun right?! I thought so…. and so did Big M.
Write out the crossword on a piece of paper first. That way it’s easy to fix if you need to rearrange words. Start with the biggest words and work out from there. Try to intertwine the words as much as possible… so it looks like a real crossword puzzle. Write out a sentence for each word. Using the across and down method. I tried to keep the sentences as simple as possible so that Big M could read them himself. Leave a blank space in the sentence where the spelling word would have gone. 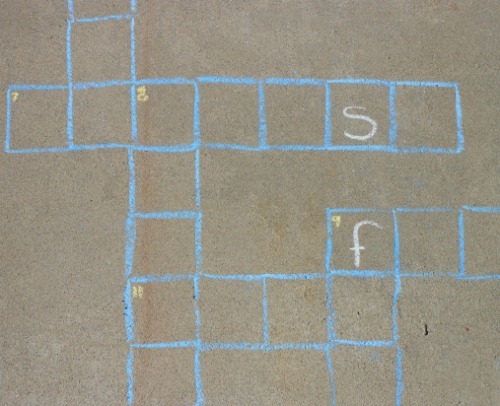 Once you have your crossword planned, it’s time to move outside. I used an old cereal box to make a square template. Mine was 4″ x 4″. It was a little small. 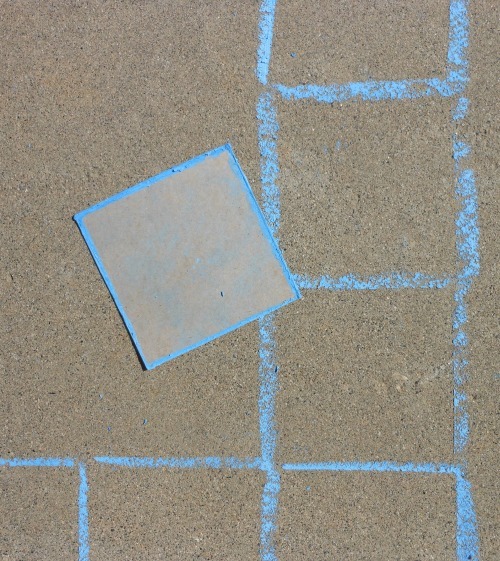 I think next time I will make 6″ x 6″ squares. Trace the template over and over to create the crossword puzzle. I started with the middle and worked out. Fill in the numbers to match your across and down sentences. Fill in a few letters just to get the ball rolling. Step back a bit and let your little one have some fun practicing their spelling words. It took a pretty long time for me to get the crossword puzzle made. Long enough that Big M was hovering, anxiously. Ideally I would have liked to get it made WITHOUT him. Next time I’ll suggest he stays inside until it’s ready. Suggest your speller start with an easy one. And if they get stuck suggest they find one that has letters. Are there more letters they can fill in? Add in a few words they know how to spell. This would be important for kids who get frustrated easily or who work best with a lot of wins along the way. Is this the first time they’ve seen the words or is this a list they’ve had some practice with? For a first time run through, point out tips for the words. Fri and end is friend. What works for you personally? I bet your kid would benefit from knowing what works for you. Help figure out words that might work in the sentence. Ask how many letters a word they think might work is. Will it fit? Does your family like crossword puzzles? Have you tried a crossword puzzle for kids? This post first appeared on April 9, 2014. 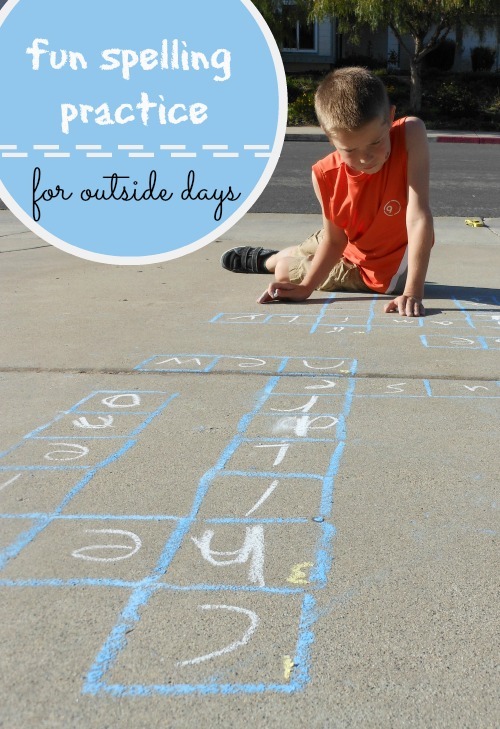 Such a fun idea to take the crossword puzzle outside! Lovely idea – I’ve just shared it on my page, http://www.facebook.com/ConsciousParentingApproach – thank you!